This week, 45 years ago, NBC aired the Star Trek episode “The Tholian Web.” The editors of TV Guide liked it so much they gave it a half-page CLOSE-UP listing. But, remarkably, printed the Enterprise upside down! 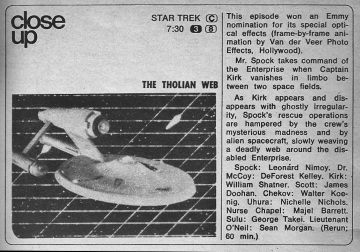 The editors of TV Guide were very fond of Star Trek and had already awarded the series eight CLOSE-UP listings when they chose “The Tholian Web” to be the ninth. But someone in their art department apparently wasn’t a Star Trek fan, and didn’t know up from down when it came to the good starship Enterprise. Later this year, with the publication of These Are the Voyages, TOS: Season Three, you can read all about the writing and making of “The Tholian Web,” including script and production memos, and new interviews with script writers Judy Burns and Chet Richards. You simply won’t believe what special effects wizard Mike Minor had to go through to create those Emmy award winning effects of the Tholian ships creating a web around the Enterprise.